I am late as always. Why am I only watching this now? I can't believe what I've missed out on. These guys are awesome!! Well, of course I already know that but still... aafgafdgsagdsahdsgdhahdasdsd! Yongguk was lookin' fine in the intro. I love this collab, B.A.P rappers meet BTS rappers meet Topp Dogg rappers, this is daebak. My personal fave in this performance is Rapmon♥ Followed by the guy who sings after him. Sorry, I'm not familiar with Topp Dogg (I do listen to their songs - 'cuz the songs are awesome - but I do not know much about the members), based on what Rapmon rapped, I think the rapper's name's Kiddoh. So that's the opening, next video is of course my Bangtan Boys performing their covers of Shinhwa's songs "This Love" and "T.O.P." Before I get my spazzing mode on, I just want to talk about the little "controversy" surrounding the T.O.P stage. Rapmon dropped the N-bomb. Yup. But the thing is, that word exists in the original lyrics (Eric has long apologized for his mistake). Rapmon did not slip it in. Neither did he have the power to change the lyrics because in the entertainment industry, you can't just modify another artist's song willy-nilly, unless you're really just asking for a lawsuit. (When SNSD performed it, there was no problem changing the lyrics since the song belongs to SM). Okay, I don't wanna talk about that anymore. Now I wanna spaazzz!! Holy cow (don't get me wrong, I love cows), V looked so hot. Thank you Big Hit for sticking him in the middleXD Then there's Jimin just being his hot yet cute self throughout the whole video until his last high note at the ending, damn. Watching these special stages make me wish that BTS would try out this concept at least once. I love for their hip-hopness, that's the reason why I'm their fan but I just wanna see them move like this again, ya know wat I mean?XD I'm too lazy to gif the moves but damn V, Jimin and Jungkook during the first stage. 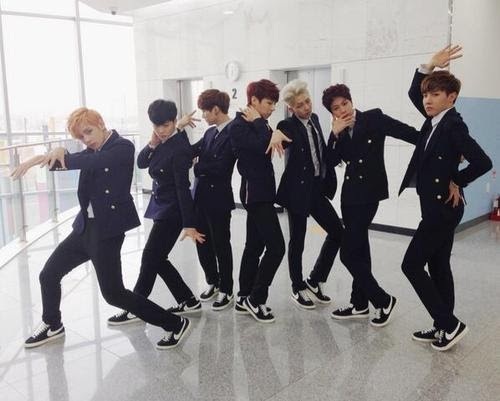 Then again...okay yeah, BTS should stick to hip hop forever and ever and ever 'cuz I just love them the way they are now - maybe just give a bit more parts to V and Jin, maybe (says a delulu fangirl who has no say whatsoever in BTS' future). Eh, I wanna go watch these vids again. Over and over and over again. Peace out!